A gawky teenager once, Varun Dhawan is now a heartthrob of millions around the globe. His looks, coupled with a body to die for, makes him and an inspiration for men and women in the country. With the perfect combination of killer looks, mischievous smile, and sculpted body, he certainly is an eye candy for all women. Varun has firmly stated his belief about fitness going well beyond muscle and is known to spend a good portion of his day in the gym pumping iron coupled with a variety of workouts that focus on heavy weight lifting. His killer body was on full show in his debut film “Student of The Year” and is incredibly defined torso is a product of his consistent dedication to maintaining a fitness level. A man of many talents, Varun is a great actor and a terrific dancer. We found out some of Varun Dhawan's fitness secrets and we’ve rounded up the best ones for you here. For Varun, it is important that he actively listens to what his body is trying to tell him because he believes that if you don’t do that, you do more harm than good. He firmly believes that if your body is injured, you should give it enough time to heal. Coming from a family that has a history of diabetes, Varun makes sure that he never compromises on what he eats. However, his taste and habits being more inclined to wholesome foods consist of lean protein, low carb, and healthy fats. He also stays away from high-salt, high-sugar, and oily foods. Along with this, he makes sure that he does not eat carbs at night. But if he does, he makes sure that they have a low Glycemic Index to avoid sugar rush in his body. 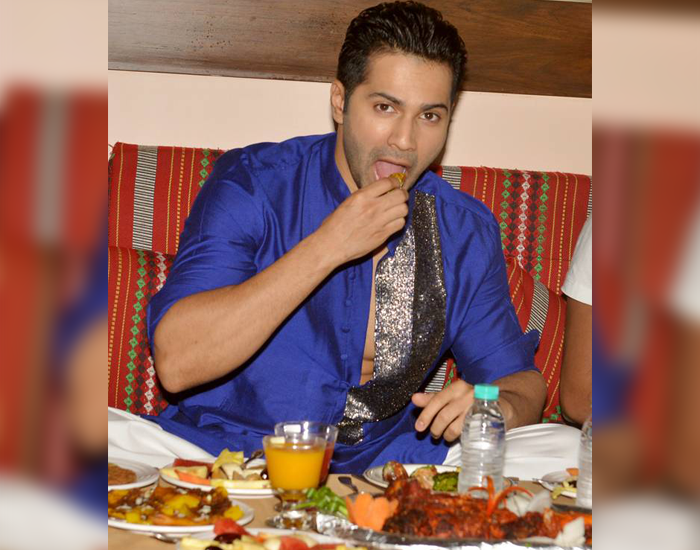 Varun makes sure to eat every 2-3 hours in small portions and drinks at least 5-6 liters of water in a day. For breakfast, he prefers to have an omelet, oatmeal, whole wheat grain sandwich. He consumes protein shake as a mid-day food. Steamed brown rice, chapattis, broccoli, baked chicken are preferred by him for Lunch. In the evening, he likes to indulge fruits such as papaya, Banana, Protein smoothie and lotus seeds. His dinner includes plenty of mixed veggies with grilled fish and green tea. An athlete during his school days, Varun was required to work hard to increase his stamina. He did so by swimming all through his school years. Today, he makes sure he swims even if it is for 15 minutes. In fact, he believes that indulging in sports activities is the best bet for a healthy body and mind. He plays cricket and squash to improve agility. Varun believes that filling your day with various activities keeps your weight in place and he relies on the Nike Fuel Band that tracks how much, how often, and how intensely he move. In an interview, Varun candidly mentioned that If you need abs, workouts are necessary because any sport cuts down the fat.The first rule for anyone who is set to start working out is a 10-15 minutes warm-up routine. This includes jogging, jumping, running, or stretching exercises of chest and shoulder. If you do not do so, you are likely to injure yourself and upset your plans of sporting a fit body. Varun gets his training from the celebrity trainer, Prashant Sawant. He trains for 5 days a week for 90 minutes, and his trainer mixes various routines (from martial arts and weightlifting to heavy-duty cardio) to eliminate any chances of him getting bored of the routine. While weightlifting helps him tone his body and bulk up whenever the script demands it, he suggests his fans aim towards having a flexible body. Rather than focusing on huge and bulked up the body, aim to acquire a limber body. As you grow older, the natural suppleness of body begins getting down, because of which you become vulnerable to injuries. A lithe body not only looks influential, it is powerful too. Varun transforms his body according to the character of his films, for which he must sweat a lot in the gym. As it is not easy to stay motivated to exercise on a regular basis, here is what keeps Varun charged up all the time. He relies on his trainer, Prashant, for his motivation. Here’s wishing the October star the best of health and success for his future ventures!